WinRAR is a powerful archive manager for Windows, Linux, and Mac OS X. It's a compression tool that makes your files smaller, which is great for saving disk space and transmission costs. It can create and view archives in RAR or ZIP file formats, and unpack numerous archive file formats. The Archiver provides complete support for RAR and ZIP archives and is able to unpack more than 40 different formats including CAB, ARJ, LZH, TAR, GZ, ACE, UUE, BZ2, JAR, ISO, 7Z, Z archives. RARLab's RAR archiver is ideal for multimedia files. It automatically recognizes and selects the best compression method. The special compression algorithm compresses multimedia files, executables and object libraries particularly well. This tool is also ideal if you are sending data through the web. Its 256-bit password encryption and its authenticated signature technology will give you the peace of mind you have been looking for. WinRAR and the RAR file format have evolved over time. Support for the archive format RAR5, using the same RAR file extension as earlier versions, was added in version 5.0; files in the older RAR file format have since been referred to as RAR4. Versions before 5.0 do not support RAR5 archives. The RAR5 file format increased the maximum dictionary size to 1 GiB; 11 different compression directory sizes from 1 MiB to 1 GiB are available, with the default in version 5 increased from 4 MiB to 32 MiB, typically improving the compression ratio. AES encryption, when used, was increased from 128- to 256-bit. Maximum path length for files in RAR and ZIP archives is increased to 2048 characters. WinRAR is a trialware product distributed as "try before you buy", offering 40 days trial period for thoroughly testing. Note: WinRAR for MacOS and Linux is a command-line only application. 1. "Files to process" option on "Time" page of archiving dialog allows to choose files based on modification, creation or last access file time. Previously it was possible for modification time only. 2. Command line -ta, -tb, -tn, -to switches accept 'm', 'c' and 'a' modifiers after the switch name. So file time conditions can include not only the file modification time as in previous versions, but also creation and last access time. Such switch can include multiple modifiers to set the same date for all specified times. For example, -tamc20190215 will process files modified and created after 2019-02-15. 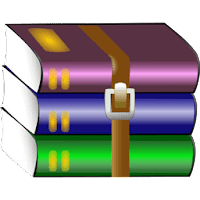 WinRAR and command line RAR use RAR 5.0 archive format by default. You can change it to RAR 4.x compatible format with "RAR4" option in archiving dialog or -ma4 command line switch. If you prefer RAR 4.x format by default, use "Create default..." button on "Compression" page of WinRAR settings and set "RAR4" in the displayed dialog. This change affects only new clean installs. If you already saved RAR format in the default compression profile in previous versions, WinRAR respects stored settings. Disclaimer: Direct downloads for the lastest version of WinRAR 5.70 are provided by the official software's author, we can't guarantee safety, availability or download speed. Moreover, we don't and we won't provide any pirated/illegal versions or tools. We recommend you to avoid it as these methods can harm your device. If you like the software, buy it to support the developers. (We provide software discounts for many worldwide brands).